Modular systems are great for a variety of purposes ranging from memorials to donor recognition. 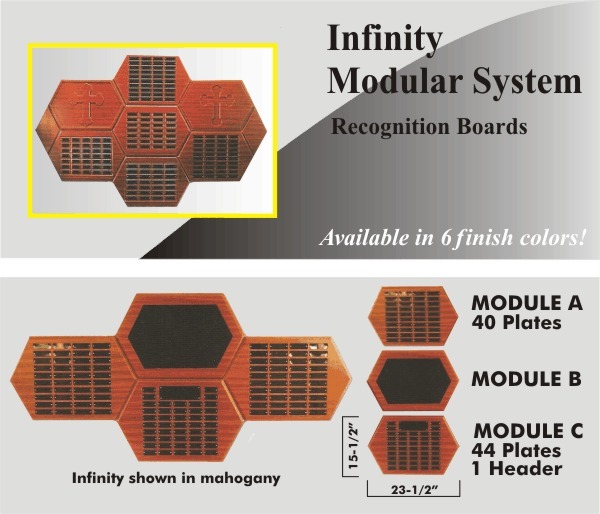 Another popular modular system, the Infinity Series allows for versatility in design and functionality.......use your imagination and create your own design for your special needs! Construction is of the highest quality engineered materials which include 3-D MDF core with a vaccum formed commercial grade cabinet vinyl laminate that is extremely durable and marr resistant. Available in six handsome wood finishes, and 3 plate configurations, the Diamond Deluxe system is great for easily adding on to in the future. Call for customization questions.